Our drought-reducing progress will go on pause for a while as warmer and drier weather returns to the region. Temperatures over the next week will climb above normal levels for the state as high pressure builds in. The best precipitation chances over the next week look to be in the mountains, with very little over northeast Colorado and the Plains. 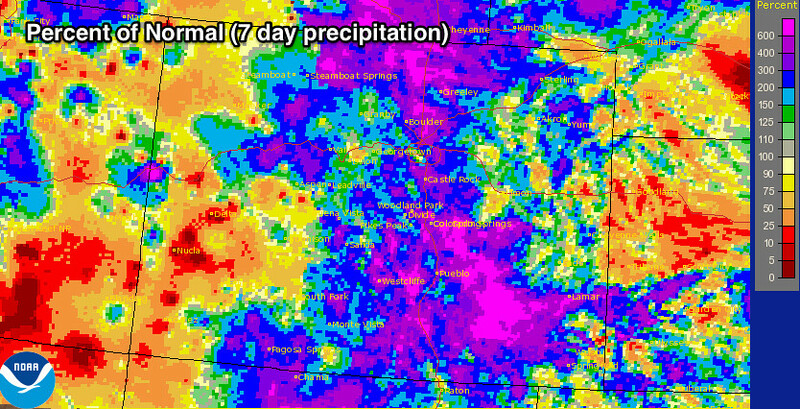 It’s been a heck of a run so far this this summer, however, and most of the monsoon season is still ahead of us. According to the latest U.S. drought monitor released Tuesday (July 15th), now 58% of the state is drought free. That’s up from 38% just three months ago. While the worst drought in Colorado still persists across the southeast part of the state, we’ve seen some relief there as well. 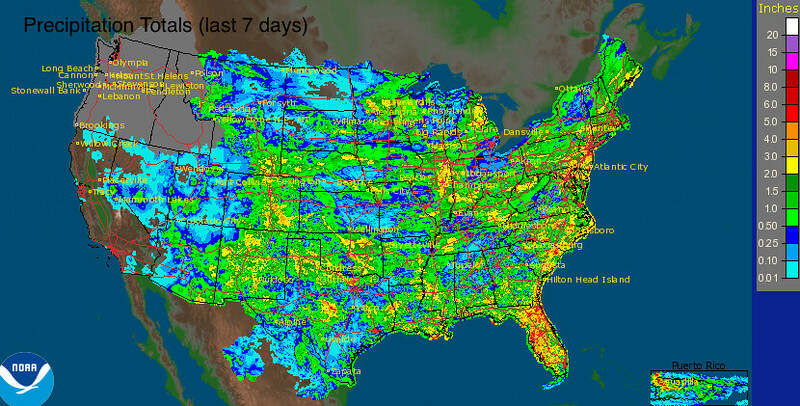 Take a look at the rainfall totals across the United States over the last seven days. Most notably, over southeast Colorado, New Mexico, and back into Arizona. Temperatures remained below normal Thursday, with afternoon highs predominantly in mid-to-upper 70s the across the metro region. We’ll climb into the low 90s for Friday and Saturday, with even warmer temperatures possible by Sunday and into early next week. We’ll keep a chance for storms going for the next few days, but those chances will be much lower than they have been. Brief downpours, lightning and wind will be possible with any storms that manage to develop over the coming days. Temperatures by early next week look to be hot. MOS guidance has highs in the upper 90s by Sunday, and staying so through at least Wednesday. We’ll stick with highs a few degrees cooler than guidance for now, but will see how the trend sets up over the next few days. 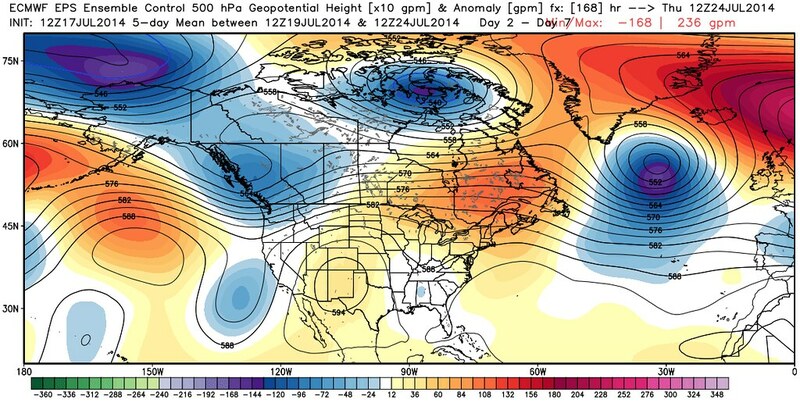 In any case, the next week looks noticeably different than the last few days across the region. Here’s the culprit. Models differ on just how long this area of high pressure sticks around for, but it does appear that overall the last 10 days of July will be warmer and generally drier than average. We’ll see how things progress, but given the pattern, hard to imagine we won’t see another break from the heat before too long. A quick peek at the CFSv2 shows it keeping us hot through day 15 (left), but brings cooler temperatures right back by the start of August (right). More to come on all of this. For now plan on a warmer and drier weekend, with well above normal temperatures possible by Sunday and into next week.